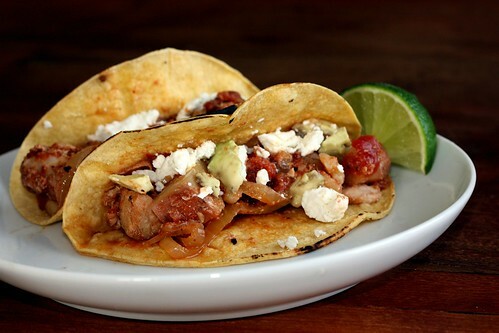 Smoky Pork Tinga Tacos with Avocado and Fresh Cheese – Elly Says Opa! Mr. Bayless, you have done it again: taken a short list of ingredients, combined it with an easy preparation method, and come up with a delicious meal. I am constantly on the lookout for slowcooker recipes that don’t use processed ingredients and/or look and sound…mushy. There are several slowcooker recipes in Everyday Mexican, which is rare for a cookbook (or, at least, cookbooks I own). This pork tinga caught my eye because I already had pork shoulder in the freezer, and the rest of the ingredients are pantry staples for me. We were definitely not disappointed. The tinga turned out smoky with a little spice, and the potatoes in the taco were something different (and good) for me. As a testament to how well-liked Rick Bayless recipes are, my 10-month old very much enjoyed his (deconstructed) taco. It was his first taste of goat cheese and chipotles, two of mom’s favorite things, and thankfully, he enjoyed them. We had goat cheese with these since it was in the fridge and queso fresco was not. The only changes I made to this recipe were to double the oregano and not remove the seeds from the chipotles, because we like the spice (noted below). I used two (15 oz.) fire-roasted diced tomato cans so I guess technically I upped the amount of that a bit. I didn’t have chorizo, so we didn’t add that (obviously) but I’ll be sure to next time because it will no doubt make these tacos even better. I almost always heat tortillas directly over my gas flame, a few seconds per side, but if you prefer you can brush or spray them with oil, stack them in twos, and bake in a 350 degree oven for 3 or 4 minutes—just until they’re pliable. The prep for this recipe couldn’t get much easier, but I did still do most of it the night before so that the morning I made this, I just had to combine everything in the crockpot and it took me literally less than 2 minutes. I cut the potatoes (and stored them in cold water), cut the pork, and combined the sauce ingredients except for the onion (which I did slice in advance, but stored separately). We came home to a fabulous smelling and delicious tasting dinner. Can’t beat that! I have no doubt these tacos would be great with chicken and beef, too. In a large bowl, mix the (undrained) tomatoes with the chipotles, adobo sauce, Worcestershire, oregano, garlic, onion, and about 1.5 tsp. salt. Pour the mixture evenly over the meat and potatoes. Cover and slowcook on high for 6 hours or low for 10(ish). When you’re ready to eat, fry the optional chorizo and then stir everything together, breaking the pork into smaller pieces. Taste and season with additional salt if necessary. Serve with warm tortillas, cheese, and avocados for making soft tacos.